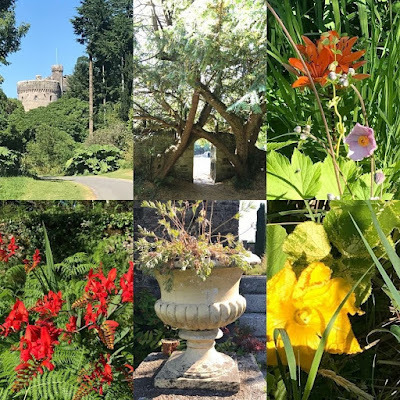 Visitors to Glenstal Abbey cannot fail to be enchanted by Glenstal Castle which was built by Sir Matthew Barrington as an extravagant expression of his claim to a lineage that stretched back into antiquity. But visitors to the abbey, school and castle also enjoy the gardens, the woods and the lakes, which serve as reminders that Glenstal has a history that stretches back to the 17th century and even further back in time. Sir Matthew Barrington (1788-1861), 2nd baronet, was a philanthropist, lawyer and landowner, and is probably best-remembered in Limerick as the founder of Barrington’s Hospital. He was also a member of the Pery Square Tontine Co, established in 1840 to build and develop the elegant Georgian houses in Pery Square, Limerick. Barrington also commissioned the architect William Bardwell to build Glenstal Castle. None of this would have possible but for Sir Matthew’s propitious marriage to Charlotte Hartigan, daughter of Professor William Hartigan, a medical doctor and professor of anatomy in Trinity College Dublin. The couple were married in fashionable Saint George’s Church in Dublin on New Year’s Day, 1 January 1814. Soon after their marriage, Sir Matthew was appointed the Crown Solicitor for Munster. Charlotte brought with her a substantial dowry that was agreed less than two weeks earlier on 23 December 1813, and that included a large tract of land in the Barony of Connelloe in Co Limerick, and more than £2,000. This new wealth allowed the clockmaker’s son to lease and then buy a great estate to the east of Limerick that once belonged to the Evans family, who held the title of Lord Carbery. Sir Matthew set about building Barrington Bridge over the River Mulcair in 1818 and he reclaimed land, laid out a magnificent park, and planted 600 acres of forest, importing trees from America, Australia, and Asia – he planted 43,000 trees in 1822-1823 alone. Barrington also created an artificial lake, and by 1825 he had developed the village of Murroe for workers as he prepared to build Glenstal Castle. 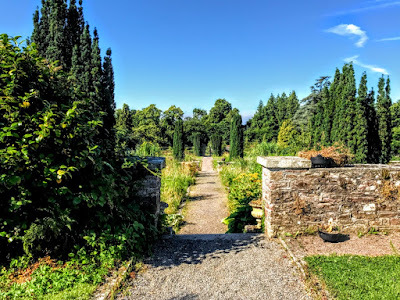 The Lady Garden behind Glenstal Castle is named after Lady Barrington, the former Charlotte Hartigan. The paths inside the Lady Garden have been restored recently, lawns have been laid, and the walls have been made good. Two years ago, 16 silver birch trees were planted on one side of the garden to commemorate the 16 leaders of the Easter Rising executed in 1916. An extra tree was added later to commemorate Winnie Barrington from Glenstal who was killed nearby in an IRA ambush in Newport, Co Tipperary, in May 1921. 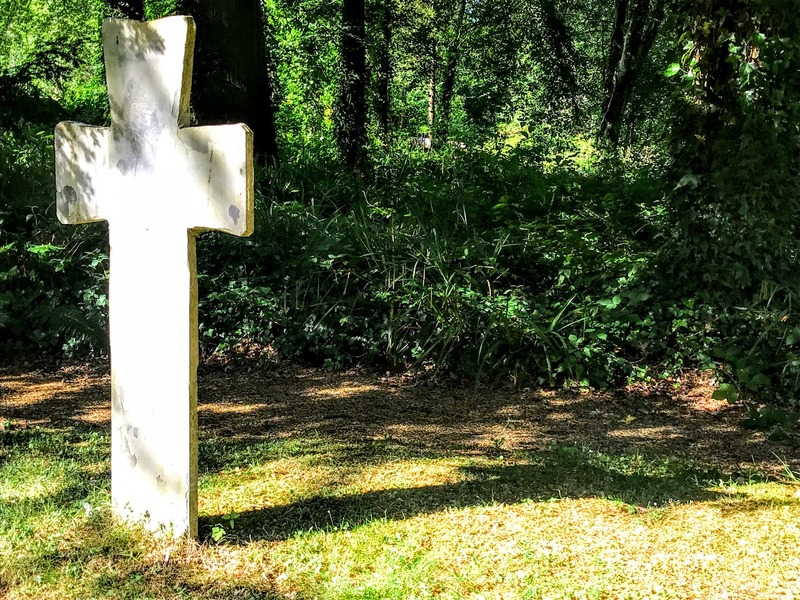 Outside the walls of the Lady Garden, the monastic graveyard is the burial place of the monks of Glenstal. 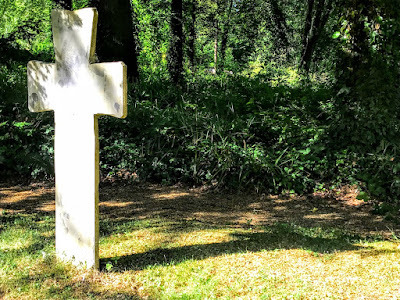 Brother Christopher Lacy, who died on 27 July 1948, was the first monk buried here. 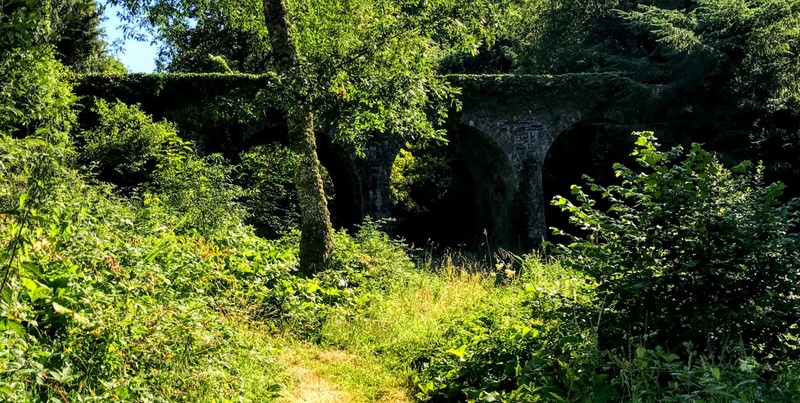 Walking along the path from the Lady Garden and the Monastic Graveyard towards the 17th century Walled Garden, a Victoria brdge, built in the style of a 19th century railway bridge, marks the dividing line between the townlands of Garranbane and Cappercullen. This bridge was built in 1860 by Sir Matthew Barrington’s son-in-law, the architect and engineer William R Le Fanu (1816-1894), who built many bridges for the Irish railways and later chief commissioner for public works in Ireland. William Le Fanu and Sir Matthew first met when Barrington was an adviser to the Great Southern and Western Railway from the 1840s. In 1848, Barrington selected the site and chose the name for Limerick Junction, still notorious for the idiosyncratic manoeuvres of arriving and departing trains. With the coming of the railways to Ireland, Le Fanu was employed by Sir John MacNeill on railway work. When the sections of line which were to become the Great Southern & Western Railway were being built in the 1840s, Le Fanu and Matthew Blakiston were MacNeill’s principal assistants. In 1846, Le Fanu became the resident engineer in charge of the completion of the Cork terminal of the railway, and he later succeeded MacNeill as the consulting engineer to the railway and superintended the extensions to Killarney and Tralee, to Tullamore and Athlone, to Roscrea, Parsonstown (Birr) and Nenagh, and from Mallow to Fermoy. Le Fanu was also the engineer for the Cork and Bandon Railway and to the Dublin, Wicklow and Wexford Railway. He designed and carried out the Limerick and Foynes line and the Bagenalstown and Ballywilliam line. Le Fanu married Barrington’s youngest daughter, Henrietta Victorine, on 15 January 1857. From 1861, Le Fanu also acted as consulting engineer to the Ballast Board. But in 1863 he gave up his private engineering practice when he was appointed deputy chair of the Board of Public Works. He retired in 1890, and died at his house in Summerhill, Enniskerry, Co Wicklow, on 8 September 1894. 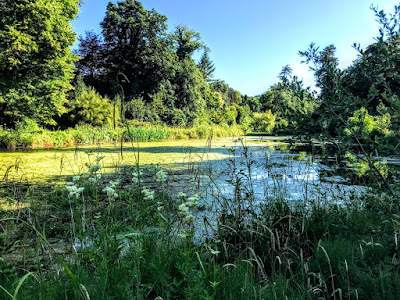 The Chapel Lake, a natural lake to the south of Le Fanu’s bridge, powers the geothermal heating plant at Glenstal Abbey. 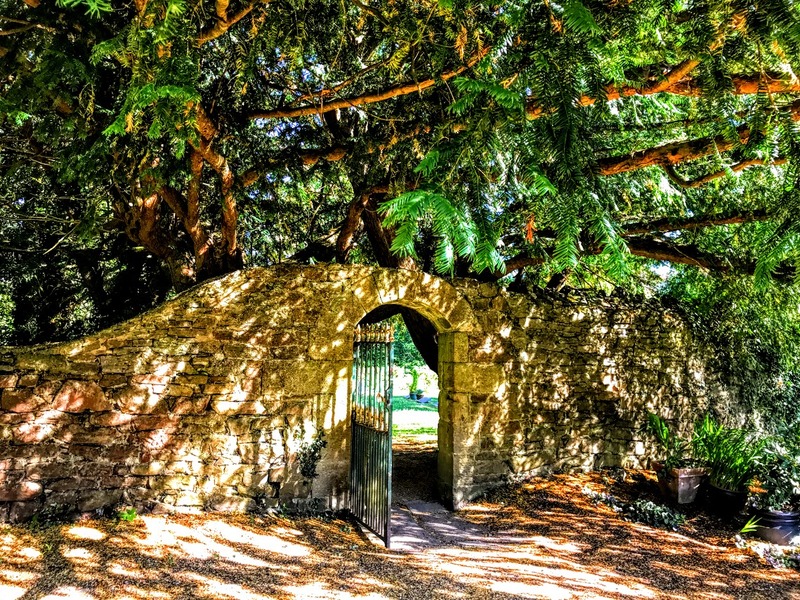 Le Fanu’s bridge links the Victorian Lady Garden and the 17th century Italianate-style Walled Garden, which was laid out in 1679-1681 by Joseph Stepney. 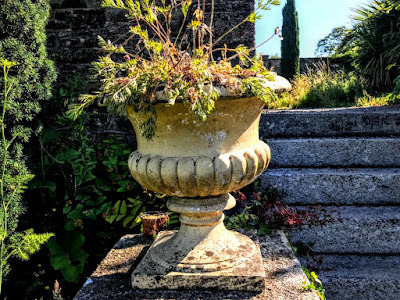 Stepney was a tenant of George Evans (1655-1720), of Bulgaden Hall, Co Limerick, who married Mary (née Eyre) in 1679 and he moved into what became the Glenstal estate at Murroe. George Evans was the father of George Evans (1680-1749), Whig MP for Co Limerick, who was given the title of Baron Carbery in 1715 because of his support for the succession of the House of Hanover to the Crown. 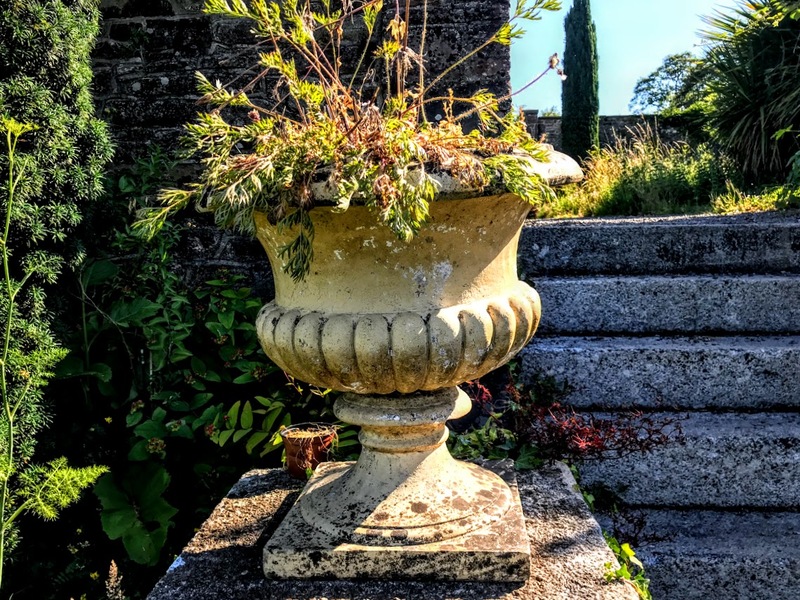 When the Carbery family defaulted on its mortgages in the early 19th century, Sir Matthew Barrington seized the opportunity to acquire their estate, and the present terrace garden was laid out by the Barrington family. 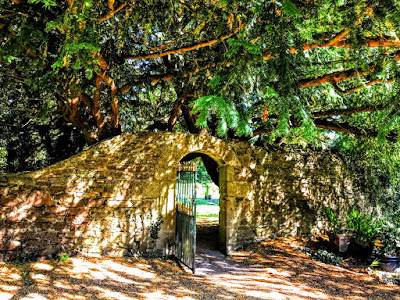 The top two terraces of the Walled Garden were redesigned in the 1990s as a Bible garden. 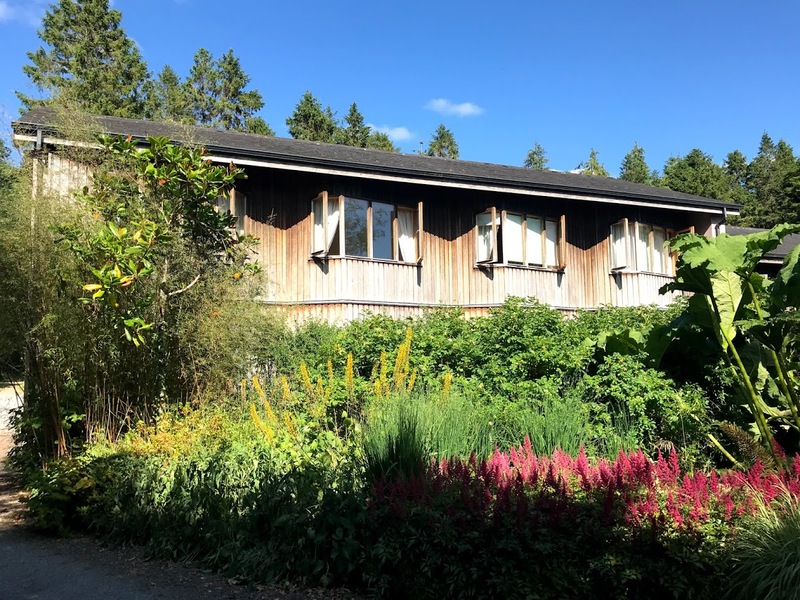 The work was carried out under the supervision of Nigel Hepper of Kew Gardens, and these areas include plants, flowers and shrubs mentioned in the Bible. Today is the feastday of Saint Benedict, the founder of the Benedict tradition, the founding figure in Western monasticism, and the patron saint of Europe. Had I stayed in Glenstal Abbey for one extra day, I would have found myself present for this great celebration in the Benedictine calendar. 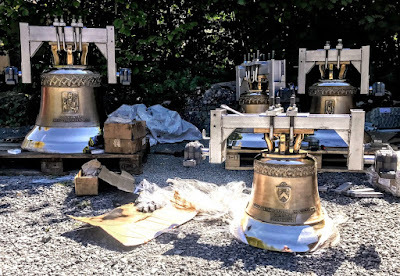 The solemnity is being marked today [11 July 2018] with a special Mass at mid-day that begins outdoors with the blessing of four new bells at the car park on the library side of the abbey church. Following the tradition associated with church bells, each of these bells has been named individually: Saint Benedict, Saint Joseph, Saint Columba and Saint Scholastica. The name of Saint Benedict is an obvious choice; the abbey church is dedicated to Saint Columba and Saint Joseph; and Saint Scholastica was the twin sister of Saint Benedict. Following the daily offices and the daily Mass in the abbey church on Monday and Tuesday made me realise how much I miss the routine of daily prayer in the life of the chapel in the Church of Ireland Theological Institute, which include the daily offices twice a day and celebrations of the Eucharist on a weekly basis, with celebrations too on the main feast days in the Church Calendar. Although I pray daily, I miss the routine and stability of community prayer that is marked out by the rhythms of the daily offices. At Matins and Lauds (Morning Prayer) in the abbey church yesterday morning [10 July 2018], we began with the hymn Ales diei nuntius, ‘The Winged Herald of the Day,’ written by Prudentius (348-413) from Saragossa. During a life of asceticism and devotion, Prudentius composed his poems that have made him one of the first great Christian poets of the Latin West. This hymn is taken from his Hymnus ad Galli cantum (‘Hymn at Cockcrow’), the first of the 12 hymns that make up his Cathemerinon, or Hymns for the Day. be watchful, for I am at hand. forbids the pure heart to sleep. and shed on us new light. This morning I am on my way to Dublin for a meeting involving some of my work in Rathkeale. 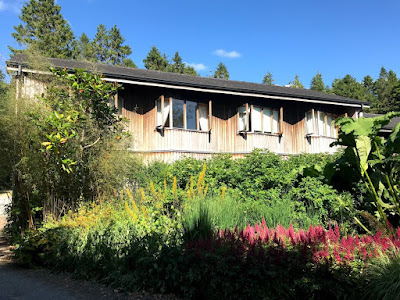 But I am grateful for my 24 hours of prayer and reflection in Glenstal Abbey.